All Star Flags has a 3x5' Nylon Christmas flag for sale now! The image is dyed onto 200d nylon heavy-duty, durable outdoor flag fabric and is finished with canvas header and brass grommets. Made in the USA. The Merry Christmas flag is simple and classic. 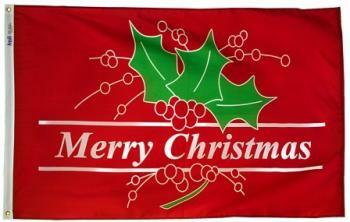 This outdoor Christmas flag has a red background with green holly leaves and berries. In the middle is a the simple holiday message - Merry Christmas in white lettering.